Doing puzzles is the ultimate me-time – it’s cheaper than a shopping spree, more beneficial than browsing social media and it’s actually really good for you. Check out these five mega benefits of doing puzzles and see why some of our readers can’t get enough of our new DRUM Puzzles magazine. There’s nothing better than finding that word in a maze and choosing the perfect word or number while completing a crossword puzzle. That’s because your brain produces dopamine, a neurotransmitter that causes you to feel happiness and pleasure. Much like when you eat chocolate – but puzzles are just way better and healthier for you. While puzzles can be challenging, it’s also a rewarding process that helps improve your self-confidence while you take a step back from the hustle and bustle of everyday living. Research shows doing a crossword is more relaxing than watching TV or shopping. It’s worth a shot – and way cheaper on the budget. There are many benefits of keeping your brain active with stimulating activities. It helps your memory and works to prevent neurological disorders like dementia and Alzheimer’s. Doing puzzles also supports the growth of new nerve cells and raises your IQ. Here’s to protecting and feeding your brain! The mental activity will encourage you to try to find better words and ways to solve the problems presented in the form of puzzles or sudoku. The different approaches, change in perspectives and process of trial and error all helps you – which will be transferred to your work life. Think about all the new words and improved skills with numbers! While you could choose to do the puzzles on your own, it could also be great family time or fun with friends and colleagues. Working as a team has been proven to improve speed of thinking and collaborating skills. Solving problems together actually helps improve relationships while you work together to achieve a goal and complete the brainteaser. Winning! 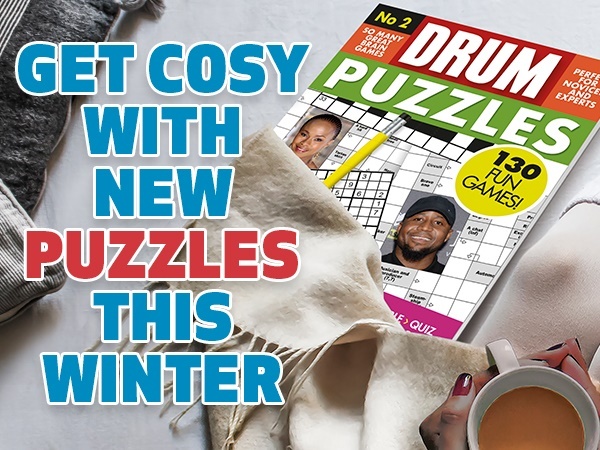 Keep your brain sharp, happy and healthy with the DRUM Puzzles magazine – it’s packed with crossword puzzles, sudoku, spot the difference and quizzes. Get yours in stores now or email shop@drum.co.za or call 021-406-4962.